An early American map of the California coastline that predates the California Gold Rush. [Untitled]. June 19, 1847 Adjutant's Office, Monterey, California. This is an 1847 map of the California coastline from Sonoma to San Diego. Though sparsely illustrated, each of the major army forts along the coast are labeled, including Santa Clara, Monterey, San Luis Obispo, Santa Barbara, Angeles (Los Angeles), and San Diego. The route to travel between these forts is illustrated by a dotted line. A table in the lower left corner gives the distances between these forts and the number of men stationed at each one and also notes that the Mormon Battalion is not included in the numbers of men stationed at the forts because their term of enlistment 'expires in July'. 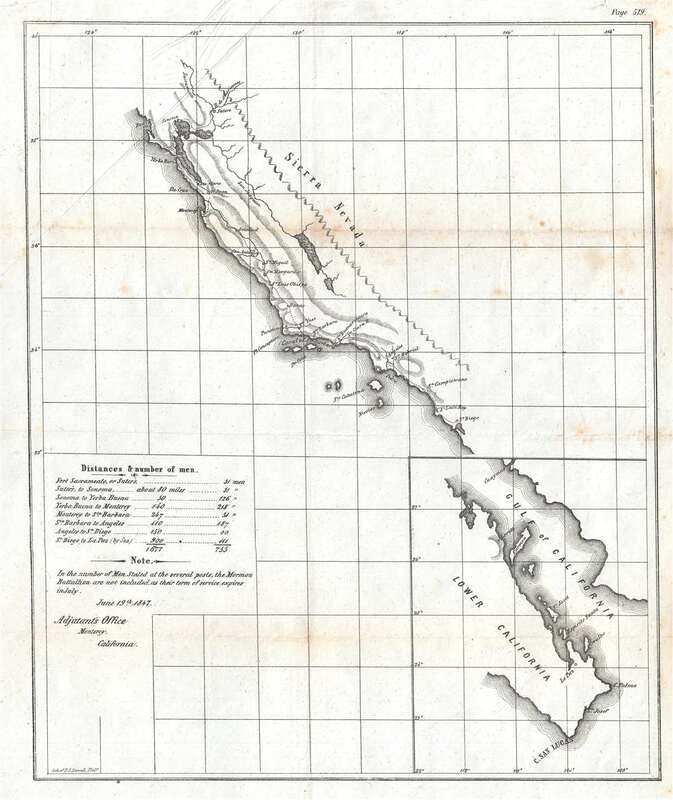 An inset map of Lower (Baja) California is situated in the lower right corner and illustrates the peninsula from north of Loreto to La Paz, where the U.S. Army maintained a fort defended by 111 soldiers. This map was created by the Adjutant's Office in Monterey, California on or around June 19, 1847. Created three years before the admission of California as a state into the Union, this is possibly one of the earliest maps of the California coastline created in the United States. It also predates the California Gold Rush by six months. As this map is untitled, finding catalog entries for it in institutional collections is rather difficult, but we have been able to identify only three times it has come to the private market in the last fifteen years. Very good. Even overall toning. Light foxing. Light wear along original fold lines. Light creasing. Blank on verso.